It may be short notice, but if you’re in the Detroit area tonight, consider heading over to the J Dilla Foundation’s Official Launch Party. 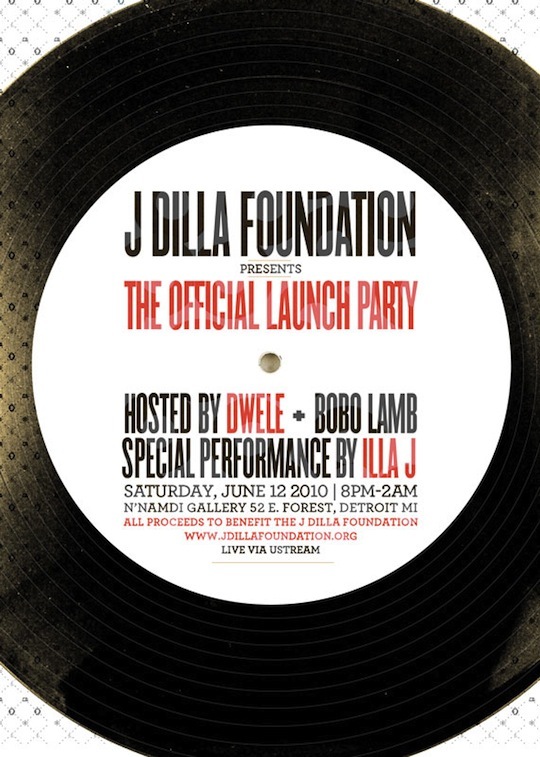 The event will be hosted by Dwele & Bobo Lamb and will feature a special performance by Illa J. All proceeds to benefit the J Dilla Foundation. The hyperlink to J Dilla Foundation brings me to a search engine. I TELL YOU ELVIS , TU PAC , BIGGIE , DILLA , MICHEAL JACKSON AND JAMES BROWN (IN NO SPECIFIC ORDER ) REALLY SHOW THAT A MUSIC LEGACY TRULY DOES LAST FOREVER AND RIGHTFULLY SO . is charles hamilton going to be there? I am just commenting to let you understand what a nice discovery my friend’s daughter went through visiting your site. She came to understand such a lot of pieces, not to mention what it’s like to possess a marvelous coaching style to have a number of people really easily fully grasp a number of multifaceted matters. You undoubtedly exceeded readers’ expectations. Many thanks for offering the valuable, dependable, educational and even unique guidance on your topic to Lizeth. Previous post: DJ Hero 2 Trailer: What’s In Your Bag?